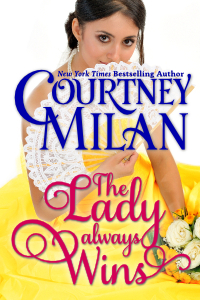 Whenever I am looking for a historical romance novella, Courtney Milan always hits the spot. This second-chance love story was no exception. It’s been seven years since Ginny broke Simon’s heart. She refused to marry him, instead marrying another man. But now her husband is dead and Simon sees his chance to reclaim the only woman he has ever loved. When Ginny turned him down years ago, it was because his parents threatened to disown him. He had no trade and she didn’t want to live in poverty. Now, he is independently wealthy, at least for now. But a looming business calamity threatens to take all that away, so he figures he must seduce Ginny quickly and secure her hand before he is financially destroyed and she has a reason to turn him down again. It’s amazing that in less than 70 pages, Milan can make me feel so invested in her characters. At first glance, you might think Ginny is the lesser member of the relationship… after all, she chose her husband for money. But we see she is so much more than that; and Simon bears his own responsibility for their separation. Ginny is practical and pragmatic, but she also loves Simon utterly and completely –even after seven years apart. Just as he loves her. There are some books three times as long that don’t make me feel connected to the characters and their feelings even half as much. I really enjoyed the romance –and the surprise twist at the end. Good stuff.